LAS VIGAS get the best of two worlds Lagoon and ocean views!!! LAS VIGAS get the best of two worlds Lagoon and ocean views!!! Beyond a series of decorative French doors lies a view that captures the beauty offered exclusively on the Riviera Maya. As Las Vigas is located directly where the majesty of the Caribbean Sea meets Akumal's own treasure, Yal-Ku Lagoon, you will see incredible waters of bright blues and emerald greens dotted with tiny islands. 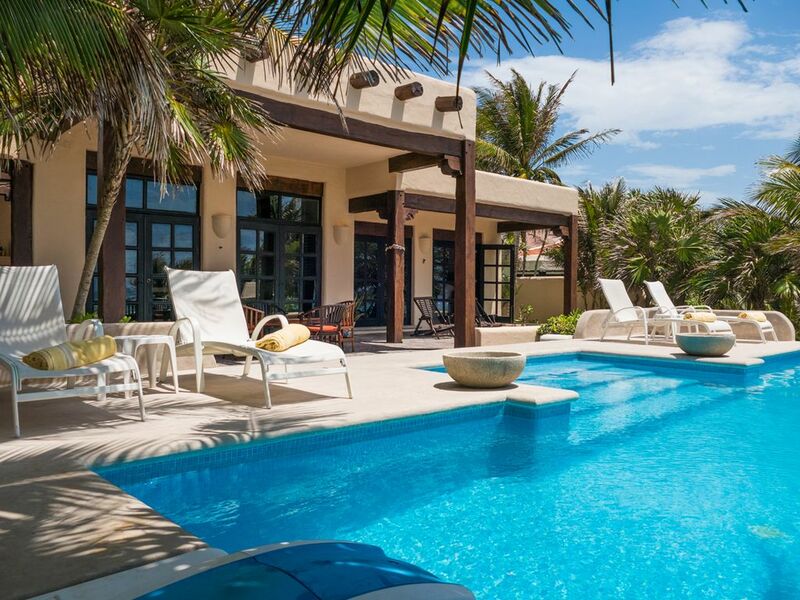 Las Vigas is a luxury vacation home perched on one of the most amazingly private pieces of land in Akumal. To allow for ample enjoyment of the Mexican Caribbean views, a partially covered patio runs along the entire oceanfront side of this Rivera Maya vacation home, providing sitting, dining, and lounging areas. There are several chaises longues around the 16x20 infinity pool making it the ideal spot for sunning. A winding cobblestone pathway gently guides you down to the water's edge. With steps and a small, cupped formation in the rocks, there is access into the water on calm days. For star-gazers and the romantic at heart, take the opportunity to enjoy the roof-top observatory, accessed by stairs off the kitchen. Las Vigas is a romantic vacation home, tucked out of sight from any other villa with a stunning view of the Caribbean Sea. From a honeymoon in Akumal to an adventure-filled Riviera Maya vacation, Las Vigas is the perfect vacation home for your holiday in Akumal. We had a lovely stay...the house is beautiful, and Alejandro and Mercedes were gracious hosts! Another Lovely Stay in Paradise! We've stayed at Villa Las Vigas many times and are always so relieved when we arrive and it hasn't changed one bit! It's just a perfect spot for a relaxing vacation, with every amenity you could hope for (fully stocked kitchen, infinity pool, plenty of beach towels, wifi, big screen TV, comfy beds, strong hot showers, etc) and direct access to the sea. Caretakers Alex and Mercedes always give us a warm welcome and do a fantastic job of tending to the villa and helping to make our stay enjoyable. Within a few weeks of returning home, we've already booked for next year! Pictures do not do it justice. We came and stayed at this beautiful home for just over a week at the beginning of October and could not have asked for a more perfect spot. The weather was fantastic- the location perfect being about 20 min from either Tulum or Playa del Carmen. Peaceful beyond words. We spent days just hanging out by the pool after getting groceries ( better selection at the Walmart in Playa than anywhere else !). The view on the deck would never get old...watching the waves crashing, birds flying, and boats go by. Beds are very comfortable, kitchen stocked with everything you could possibly need, decorated with superb taste, housekeepers ALEX AND MERCEDES were amazing and very discreet as well ! Due to the location- water is always calm. We will hopefully be back to this PERFECT holiday vacation home! Las Vigas does not disappoint. This was our third time staying here and the house is so comfortable you might not want to leave. Mercedes and Alex are gems and always accommodating. Mercedes prepared a wonderful dinner for us that was the best of all our dinners. There is plenty of space in or out of the sun and great snorkeling in the lagoon. The pool is very inviting after a hot day of touring. We would definitely stay here again and would recommend it highly. We've stayed in several villas along the Mayan Riviera and this was the best! This is a beautiful home, located in a quiet area of Akumal, with direct access to the Yal Ku lagoon for spectacular snorkelling. The decor is second-to-none, well-appointed throughout and the caretakers are very pleasant and helpful. Our first reaction when opening the back patio doors was "Oh, we HAVE to come back here again!" Tours of Mayan Ruins. Swimming and snorkeling in the Yal-Ku Lagoon. Go and a have a drink or lunch in the La Buena Vida restautant on Half Moon Bay. Rates include taxes. $3000-7000/wk US Dollars Maximum occupancy is 4 people NO SMOKING INSIDE VILLA Villa Las Vigas allows only Saturday to Saturday bookings for February and March. + $45 Accidental Rental Damage waiver.